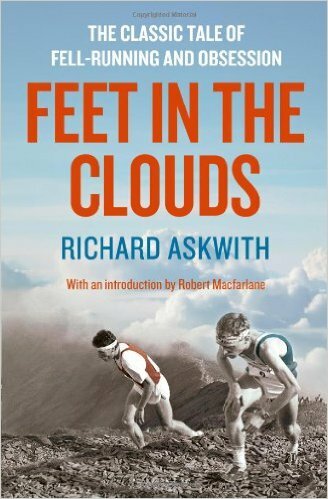 ‘Feet in the clouds’ is a book about fell running by Richard Askwith, a London journalist, who gets hooked on the sport of fell running. He tells a potted history of the sport, and also his own personal endeavours as a middle of the road aspiring fell runner. Although there is no mention of cycling, amateur cyclists will see a kinship in many of the things Askwith talks about – the club scene, the attraction of the great outdoors, the great characters of the sport, to the physical and mental challenge of running up steep hills. More than any other branch of cycling, it reminded me of the hill climb scene in domestic UK timetrialling. The slightly crazy idea of finding the steepest hills and running / cycling up them. The only difference with fell running, is the even more crazy run back down the mountain. I didn’t have any recognition of the names in the book. There wasn’t a single fell runner who I recognised, apart from perhaps Ron Hill, who wasn’t really a fell runner. This is perhaps proof of the amateur nature of the sport; a sport, which more or less has avoided the trappings of commercialism. Though, its not a completely rose-tinted view of the sport. For example, there is a chapter on the senseless amateur / professional divide of the 70s, 80s and 90s. Which to a millennial will make absolutely no sense. In the book, there are some remarkable stories of ordinary people, who – though fell running – did extraordinary things. For example, the likes of Billy Teasdale who wouldn’t use a car, but just cycle, run or walk the 20 miles to the start of a race, win the race, run home, and then spend the evening working on the farm. It kind of makes Monty Python’s Four Yorkshireman look like a walk in the park. It is also an interesting insight into the mental challenge of sport. The main thread running through the book is the author – Richard Askwith’s own attempt to do a “Bob Graham” – a 24 hour attempt to run 42 of the highest peaks in the Lake District, making a total of 27,000 ft of ascent. Only one in three succeed in their attempt. Askwith succeeded at his fourth attempt. The change in attitude that accompanied this final successful run is quite revealing. It is definitely a sport, which pushes you out of your comfort zone – and enables you to tap into deep reserves. The most striking thing about the book is that it made me think if I wasn’t a cyclist, I would take up fell running. In fact there is even a part of me, which wishes for the quiet of a Lake District fell, rather than fighting traffic on the A31. It is also a quiet homage to the spirit of local clubs and volunteers who give up their time to promote amateur sport and the amateur sporting ideal. If not a brother to a “Corinthian Endeavour”, it is certainly a close cousin. BTW: I’ve just happened to start reading a book by same author about Emil Zatopek – The Rise and fall of Emil Zatopek, this also looks a great book, if you are looking for a story about a real sporting hero. Yes, that is an excellent read they seem to be a breed alone. Another great read is “Sleep” by Nick Littlehales, this guy is responsible for setting up the sleep patterns and equipment for Team Sky, Team G.B. Man Utd, Chelsea, Real Madrid and many others. Its explained to me a lot about my sleep patterns. From the other side of the fence, I am a fell runner who has just turned to cycling after years of watching the sport. My fell running experience taught me that the first thing to do was join my local club and I can tell you that your impressions are right: there is a real similarity between the two sports in terms of their ethos and atmosphere. I felt at home immediately. The two worlds meet at the Harriers Vs Cyclists race held every year in Bingley, which is a great race if you ever have the opportunity to join in, or watch.